I always, always need more jeans. Especially because I never machine dry them so they won't shrink in length. So it takes me two days to wash them, and I currently only have two favorite pairs. I like my LA Idol jeans. While you can get them through a Vault Denim representative (they do home parties with jeans), you can also get them online. I like this pair of skinny jeans to go with my blue-print shirtdress. 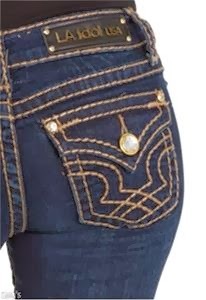 And while I would swear the two pair I have are closer to a straight leg, apparently I'm mis-judging it, because all that's available besides skinny is bootcut. So fine, I could use a pair of bootcut too. Not real picky on the pocket design. The two pair I have and like are size 7.